Dhanush, along with his family, wife Aishwarya Dhanush, parents, Mr and Mrs Kasthuri Raja, has offered an amount of Rs. 50000 to 125 farming families. This event took place this morning at Sankarapuram, Theni, during Dhanush and his family's visit to their native temple. 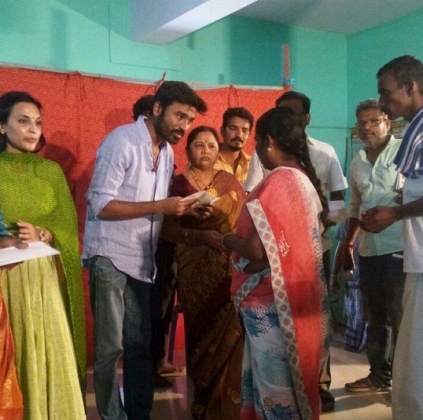 After taking help from director Subramaniam Siva, cinematographer Velraj and Dhanush Fans Club, the VIP actor formed a team and decided to donate 50000 to 125 farmers, who are recognised by the Government of Tamil Nadu. This humble gesture of Dhanush to help the farmers has fetched good praise for Dhanush and his family, among the public.